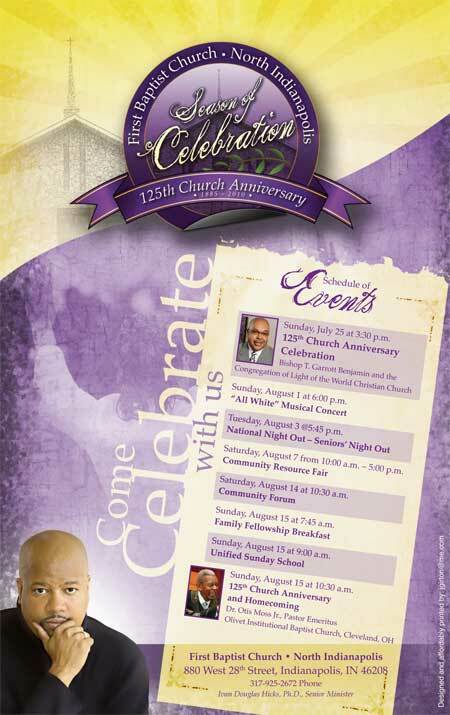 First Baptist Church North Indianapolis contracted our services to provide a complete branding and print campaign for their 125th city-wide church anniversary celebration. We provided designs for full color posters, full color flyers, black and white flyers, handbills, and full color, double sided postcards. Additionally, we provided printing services and counter displays for their committee sign ups at the church. We were excited that they would entrust us with such a monumental occasion. We were able to get all of this done for First Baptist in less than 5 days. Marketing was on the street within a week. Oh, I almost forgot. We designed a 1,000 piece puzzle for the anniversary as well. I guess it added a little fun to the weeks worth of activities.